Former Bruins playmaker and center, Marc Savard, looked to Twitter to try and silence the Chiarelli critics. General manager Peter Chiarelli has achieved a Stanley Cup victory and even made it back to the final again for a second time in 3 years. Most long time Bruins fans could agree he has been a far better selection than Mike O'Connell and Harry Sinden, former general managers. However, this season the Bruins stand at eighth place in the East, and fourth in the Atlantic Division. Players have underperformed, the team has been hit with constant injury, and questionable moves over the past few seasons have brought Chiarelli's job into jeopardy. The Bruins have a very tight cap, one that was supposed to go up, remember? As the regular season comes to a close, it doesn't appear that there will be a decent hike in the cap, and the Bruins continue to battle. 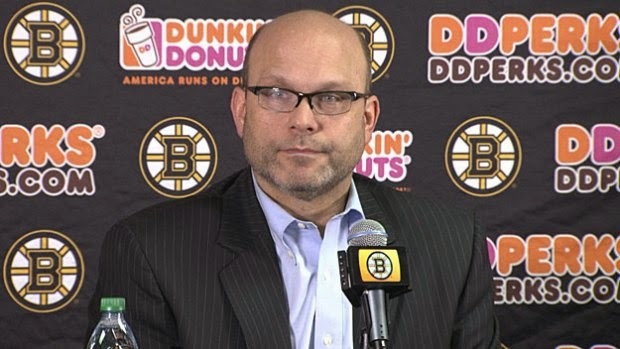 Bruins nation need to lay off Peter Chiarelli !! In the last 5 years his record speaks for itself a Stanley Cup and a Stanley Cup final !!! Peter Chiarelli just announced the signings of Torey Krug to a one-year extension, worth $3.4 million, and Reilly Smith to a two-year extension, worth $3.425 million per year. There seems to be mixed reactions across the board on both of these signings. What Bruins Nation must remember are the contracts that these two gentleman signed prior to the regular season. Krug and Smith both took a respective pay cut allowing Chiarelli to fit them under the cap for this season. These contracts are right where they should be money-wise compared to what both players are making this year. Although both players have also struggled this season, we have seen what Krug can do with his offensive capabilities and especially on the powerplay. We have seen that Reilly Smith skates well with Patrice Bergeron and Brad Marchand and has the ability to be a consistent 20-30 goal scorer. So with his tenure in Boston and all that Chiarelli has achieved, does he deserve a chance to try and fix the situation? Stats and information found here.